When Mom Is Emotionally Unstable. Seven Ways To Heal. For many this word brings with it childhood memories of feeling safe while being tenderly tucked into bed, of band-aids and hugs when you scraped your knee, or wise advice given when you fell in love for the first time. You watched your mom and learned from her; she was committed to family, friends, work, church or community…but mostly to you, her child. Her love was unconditional and no matter what life might throw at you as you grew into adulthood, she always provided a safe place to land. For others, “Mom” is as far away from those memories as you could get. Instead, your childhood life was fraught with ridicule from your mother. Disdain. Screaming. Accusations. Or eerily quiet hostility. Maybe you could not get out of the line of fire — or you seemed completely invisible to her. Everything was your fault according to your mother…and indeed might still be, even as in your relationship with her now..
Christine Ann Lawson, in her book “Understanding The Borderline Mother,” highlights ten common thoughts of children who live with mothers on the border between rationality and irrationality. What diagnostically is termed Borderline Personality Disorder, these women have a way of relating to self and others that is intense and unpredictable, often filled with severe mood swings and actions that match. This abuse is often accompanied by a confusing sense of being loved. When it’s good, it’s very good. Your bond with your mom is complex, and complicated. Many have seen the movie “Mommie Dearest,” which portrayed just such a relationship between mother and daughter, Joan Crawford and her adopted daughter, Christina. There was incredible volatility, constant criticism — beatings with a wire hanger because one was found in Christina’s closet, Yet the outer world saw only a mother-daughter combo that oozed love and adoration. Not all abuse is dramatics. Some of it is much more subtle — manipulation, neediness, or guilt trips. Not all abusive moms have BPD. Sally Field’s mother in the TV mini-series “Sybil,” identified as having paranoid schizophrenia, was highly abusive. Susan Heitler, Ph.D. notes that borderline personality and narcissism can be intertwined, narcissism being the tendency to make everything about yourself, with almost a total lack of empathy. How do you figure out how to be in her presence – have a relationship with her – while not allowing yourself to be sucked into the vortex of her emotions? 1) Read books that provide strategies. 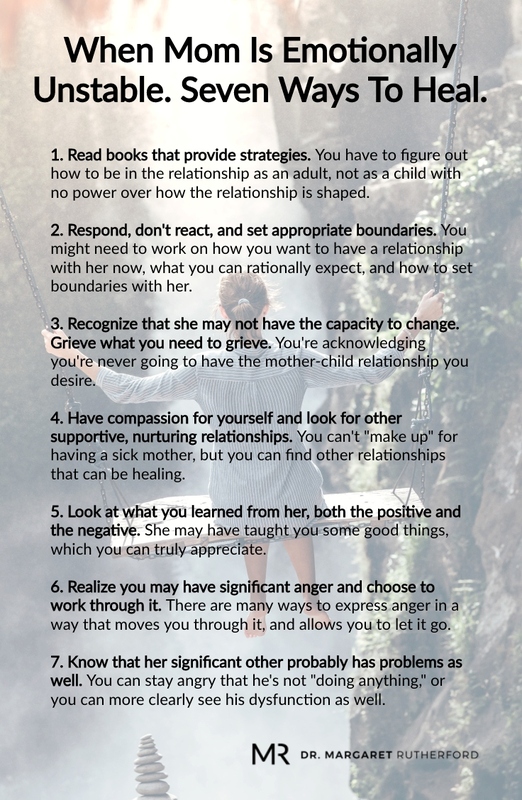 For borderline personality, “Understanding The Borderline Mother,” is a wonderful resource, as is, “Stop Walking On Eggshells” and “Lost In The Mirror.” “Disarming The Narcissist” and “Trapped In The Mirror,” are great books for understanding narcissism. She is your mother. And often, you desire a relationship with her. You want her to know your own children, but not to influence them negatively. You have to figure out how to be in the relationship as an adult, not as a child with no power over how the relationship is shaped. 2) Respond, don’t react, and set appropriate boundaries. Working with a therapist can be very helpful to bounce off what your automatic reactions are to what she says and does, and change them into less reactive ones. You might need to work on how you want to have a relationship with her now, what you can rationally expect, and how to set boundaries with her. Basically you’re deciding what discussions you’ll participate in, and ones you will not. That will help you have a much greater sense of power and control while interacting with your mother. 3) Recognize that she may not have the capacity to change. Grieve what you need to grieve. She may be living a miserable life, but not know or have the insight to change her belief system. She’s even less likely to understand the impact of her behavior on you and others. Thus, you have to grieve. You’re acknowledging you’re never going to have the mother-child relationship you desire. 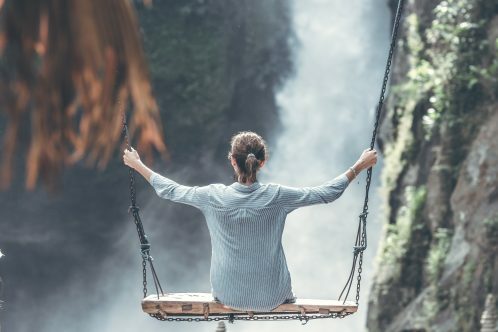 If your expectations change as you realize she doesn’t have the capacity to make the changes you would love, your own life may be made more calm, and less chaotic. And you can look to see what you might can enjoy about the relationship as it exists. 4) Have compassion for yourself and look for other supportive, nurturing relationships. Your mom has significant mental problems, And yet, you may still be trying to give her the chance to love you well. It’s not what should have happened and it’s certainly not an easy place to be. You can’t “make up” for having a sick mother, but you can find other relationships that can be healing. Realize she may have great difficulty knowing that you’re growing closer to someone else, and try to sabotage that relationship. You can see if she has the capacity to honor potential new boundaries that you establish. If not, you can work to not be governed by her reaction to you being loved well by someone else. You’ve done nothing wrong, and a healthier mom would be happy for you, not jealous or insecure. 5) Look at what you learned from her, both the positive and the negative. We can all be heavily influenced by what our parents tell us. How they act. She may have taught you some good things, which you can truly appreciate. However, you may have picked up some of her distorted and overly emotional reactions. Detecting this is hard to do, and requires you taking an objective look at yourself. Taking responsibility, and not blaming her for what you say or do today? That requires maturity. 6) Realize you may have significant anger and choose to work through it. You can’t go through something like this without anger. And those feelings are likely getting worked out in your other relationships, especially in your primary partnership. Perhaps in a healthy way. Perhaps not. There are many ways to express anger in a way that moves you through it, and allows you to let it go. You need to find those ways, rather than justifying continued resentment or a sense of victimization. Those reactions will only make your own life unhappy and emotionally stuck. 7) Know that her significant other probably has problems as well. Whether it’s your biological father, stepfather or someone she has been living with, he may be caught up in the chaos as well. You can stay angry that he’s not “doing anything,” or you can more clearly see his dysfunction as well. You can figure out what emotions belong to which person. Your mother. Your father. This post was originally published on August 1, 2015 and updated on October 13, 2018.